81km on track plus 10 km lost in the rainforest…. 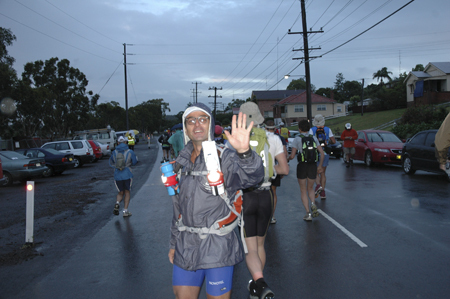 After 2 weeks of 30+ degrees in sunny Queensland I was not looking forward to a weekend of running in the mud and rain…..
After final preparation and a rough night on a camping ground in pouring rain, I was as ready as one can be for the big race. 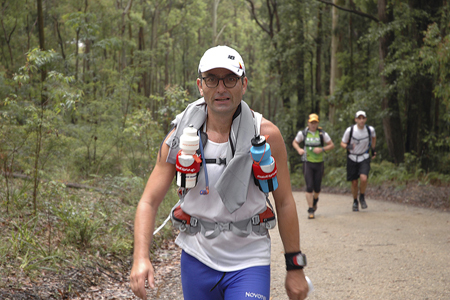 Started the first leg of 29 km as per plan but soon realised that those steep ascents will slow me down quickly and the even steeper descents go straight into my legs…. Those hills were killers – I have never walk up such steep hills, bar of climbing in Nepal! I at least enjoyed the great view from the top but my legs suffered. pretty buggered after almost 8 hours of running for 52 km! With a fresh shirt, some better protection from the rubbing backpack and with fresh drinks and food I attacked the 3rd (hard) leg. Since the whole course is not specifically marked for this race but only uses the National Park Markers it is very important to keep an eye out for those small, greenish markers along the Great North Walk….twice already I was, for a short moment, disorientated but fellow runners kept me on the right track however 3rd time was un-lucky – the race route turned off sharply to the right into the thick under wood and being alone on the road I missed the barley visible marker – I kept on going straight and even so I was a bit confused for not seeing any markers for a while I believed to be on the right road as per the map so I kept going for far too long until I realised that I was completely lost! 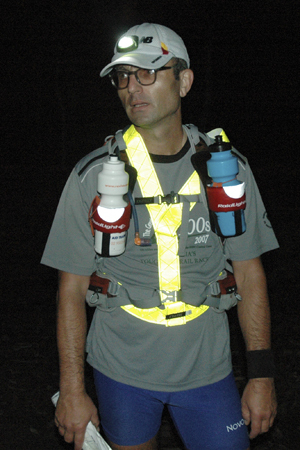 valuable energy and kind of took the wind out of my sails…..lucky I saw another runner just disappearing into the woods were I missed my turn-off and I join him for the second part of the 3rd leg….however I was already demotivated and descending into the dark, dense rainforest down to the Basin the leeches started to attack and with the very small and narrow track barley visible in the night the risk of slipping and twisting an ankle became very high for my slow and tired legs! and extra 10 km in-official km covered! 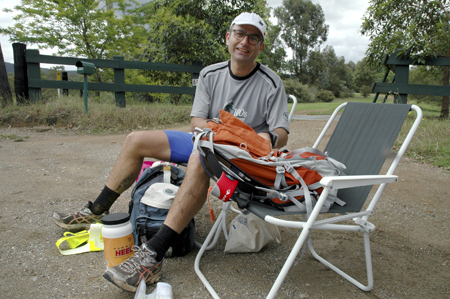 Even so I still had an hour or two up my sleeve before the cut-off time I could not see myself enjoying the reminding 94 km, especially with the next 10 hours in the dark so I took my loses – 2 lost toe nails, 12 leeches bites and very sore legs. 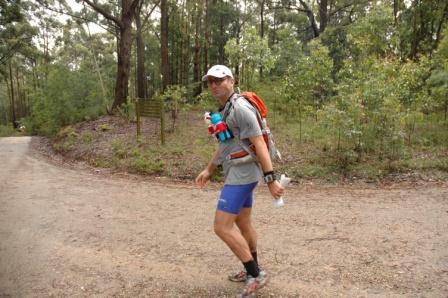 I will improve my navigation skills and listen to the pro to go extra easy on such long ultra marathons…..I’ll be back! A big thank you goes to my crew – Uli and Warren. Without them this event would be twice as difficult and it made all the difference to know that not only some fresh food and drinks but also support is waiting at each CP. Lucky for them we made it all home by 2am and they did not have to drive the whole night from CP to CP….last runners arrived at 5 pm on Sunday afternoon at the finish – that is 35 hours after the start!!! Winners finished in 23 hrs 30 min! On a positive side – the backpack tested great and with a few changes it will be perfect for Morocco. Food wise I tried more stuff out and I can say that I am now almost set for the Marathon des Sables…so now it is back to training – building more strength and specifically preparing for a multi day race rather then one long day race.